The cast and crew of Bohemian Rhapsody were under pressure after the film's 2019 Golden Globes win. After winning the award for Best Motion Picture, Drama at Sunday night's star-studded ceremony, the musical biopic's victory was met with questions and mounting controversy particularly around the film's fired, but credited director, Bryan Singer. In late December 2017, it was confirmed that Singer was replaced by Dexter Fletcher with just weeks left in finishing the film. In a statement released at the time, Singer said, "With fewer than three weeks to shoot remaining, I asked Fox for some time off so I could return to the U.S. to deal with pressing health matters concerning one of my parents. This was a very taxing experience, which ultimately took a serious toll on my own health. Unfortunately, the studio was unwilling to accommodate me and terminated my services. This was not my decision and it was beyond my control." However, he was accused of allegedly being late and absent from set, reportedly causing conflict between him and members of the cast. "Rumors that my unexpected departure from the film was sparked by a dispute I had with Rami Malek are not true. While, at times, we did have creative differences on set, Rami and I successfully put those differences behind us and continued to work on the film together until just prior to Thanksgiving," Singer retorted in his statement. "I wanted nothing more than to be able to finish this project and help honor the legacy of Freddie Mercury and Queen, but Fox would not permit me to do so because I needed to temporarily put my health, and the health of my loved ones, first." Despite his replacement, Singer was ultimately credited as director on the film. "Basically, Bryan had some personal issues going on. He wanted to hiatus the movie to deal with them, and the movie had to get finished. That was what it came down to… It wasn't about reinventing the wheel. We needed someone who would have some creative freedom, but work inside a box," producer Graham King told Variety. As the film's release loomed closer, the director also spoke out ahead of an unpublished Esquire article, which he claimed would "attempt to rehash false accusations and bogus lawsuits," seemingly referencing past lawsuits accusing him of sexual misconduct, which has has repeatedly denied. On Sunday night, Singer reacted to the news of the film's win on social media. "What an honor. Thank you #HollywoodForeignPress," he captioned a behind-the-scenes shot from making the film. However, there was no mention of him during the group's acceptance speech nor in Rami Malek's speech for Best Actor in a Drama. Backstage after the win, reporters questioned the team about Singer. "How big of a hurdle was Bryan Singer's departure and do you share the award with him tonight?" one member of the press asked. "Not something I really should talk about tonight," King replied. While he tried to dodge the topic, another reporter followed up, asking, "So you didn't feel compelled to talk about him on stage—you didn't feel it was appropriate?" "There's only one thing we needed to do and that was to celebrate Freddie Mercury in this film," Malek answered, volunteering himself for the question. "He is a marvel. There is only one Freddie Mercury and nothing was going to compromise us giving him the love, celebration and adulation he deserves." King added, "Every single person that worked on this film collaborated and did it out of the passion of making this story. That was everybody." Online, some took issue with the film winning amid the #MeToo movement. "Remember #HollywoodForeignPress, the director attached to your #BestPicture winning film is #BryanSinger. Great job! #GoldenGlobeAwards," one person tweeted. "That awkward moment when your film won Best Actor & Best Picture, yet you can't say the words 'Bryan Singer,'" another pointed out. Nominee Elsie Fisher unexpectedly got caught up in the Twitter debate when she expressed her happiness over the win. 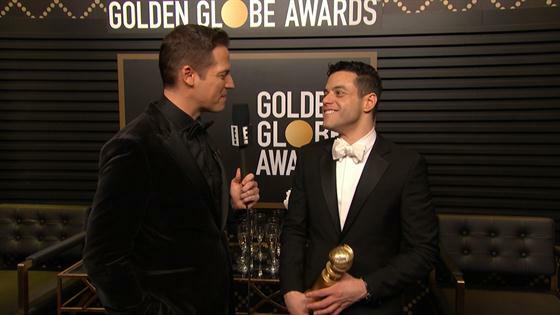 "IM SO HAPPY RAMI MALEK AND BOHEMIAN RHAPSODY WON GOLDEN GLOBES IM THRILLED TONIGHT IS THE BEST NIGHT!!!!!!!!!!!!!!!" she initially tweeted before following up with, "I'll continue to be proud of Rami and the supporting cast because they are incredible, but otherwise I will hold back. Understand this though; there are many problematic people in Hollywood, and as someone who is busy frequently I don't always have time to keep up. So tell me."